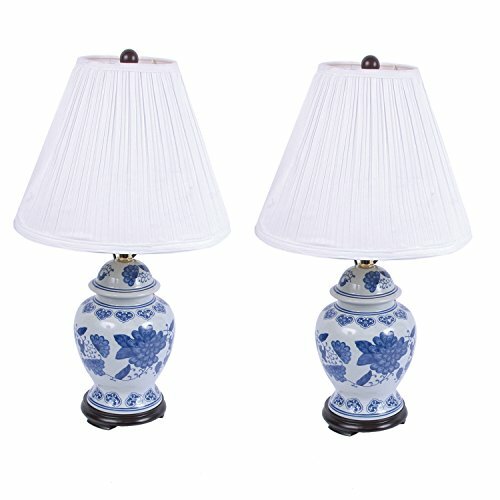 This exquisite set of two blue and white porcelain table lamps is perfect for a traditional, Asian-themed or country style living room or bedroom. It features a grand porcelain temple jar base decorated in an intricate blue and white floral pattern. A clean white drum shade sits atop the light, and black finish foot and finial make wonderful accent touches. Since each porcelain base is handmade, there may be slight variations in size, pattern and color.- Each lamp overall: 25" high. Base is 6" wide. Shade is 9" at the top x 15" at the bottom x 10 1/2" high.- Each uses one 150 watt bulb (not included). 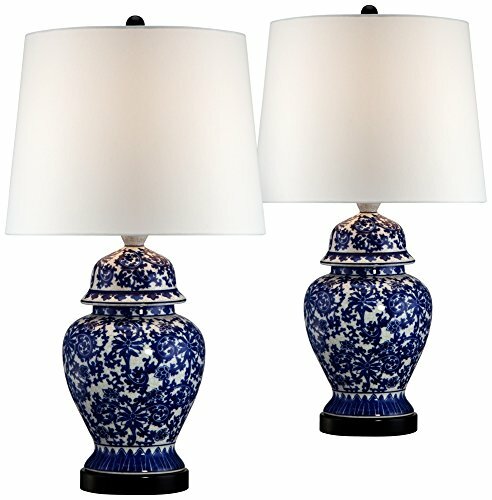 On-off socket switch.- Set of two porcelain table lamps from Regency Hill.- Hand-made, with a hand-applied blue and white glaze finish porcelain temple jar base; may be slight variations in size, pattern, and color.- Black finish foot and finial. White drum shade up top.- Each includes 8 1/2' black cord. 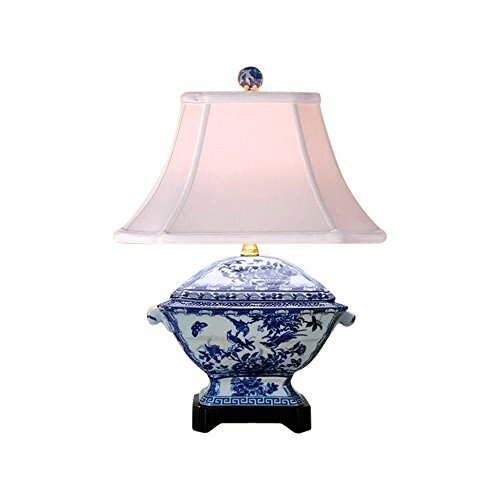 30" x 19" Large Blue & White Canton Ginger Jar Table Lamp with Blue Floral Motif and White Cut Corner Square Double Lined Silk Shade. 3-way, 150 Watt max. Turn Knob Switch. Heavy Duty Brass Hardware and Harp. Illuminate any room with this unique Ginger lamp! beautiful ceramic lamp features Ginger jar design. Matching set of 2. 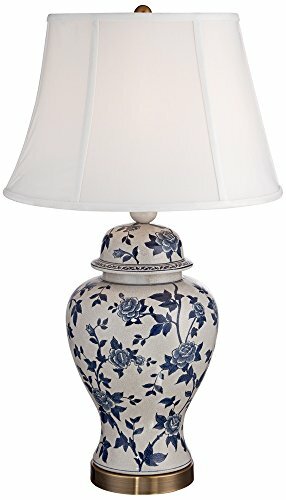 A visually stunning table lamp in a temple jar shape with a delicate rose vine design in a rich blue and white color pattern. A crackle ceramic finish adds an antique-inspired look. 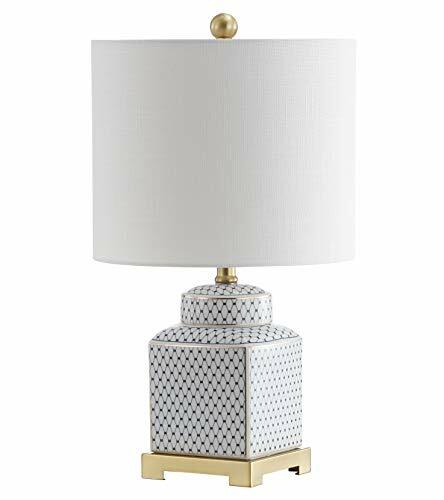 While the handsome white lamp shade will complement any style decor. A brass base completes the look.- Overall: 25" high. Shade is 12" across the top x 15" across the bottom x 10" high.- Uses one maximum 150 watt standard base bulb (not included). On-off socket switch.- Ginger or temple jar table lamp; a Barnes and Ivy design.- Blue and white rose vine pattern. Crackle ceramic finish. 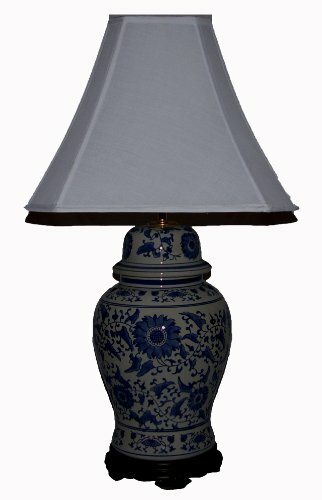 Polyester fabric shade.- White bell lamp shade with ball finial. 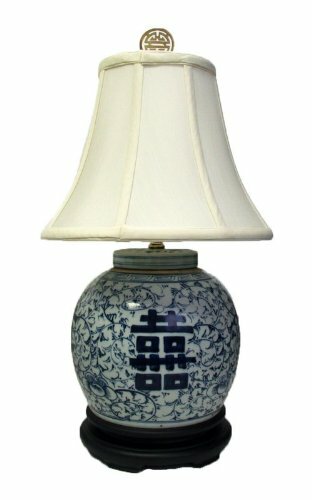 We turned this hand painted blue and white double happiness ginger jar into a charming table lamp. It is perfect for traditional or Asian themed decor. Ginger jar itself measuring is about 9" tall and 8" diameter (widest part). Wooden base is about 2.25 inch tall. Shade is 12" (bottom diameter) off white piped seam fine fabric bell shape with fabric lining on the inside. Total height to the top of finial is 23". Shipped by FedEx home delivery and fully insured for complete reliability. A square ginger jar in classic blue and white gets a modern update with a chic fishnet glaze pattern and brass riser. Topped with a linen drum shade, the result is both preppy and classic. Evocative of heirloom chinoiserie styles, this modern twist is a chic addition to any table. 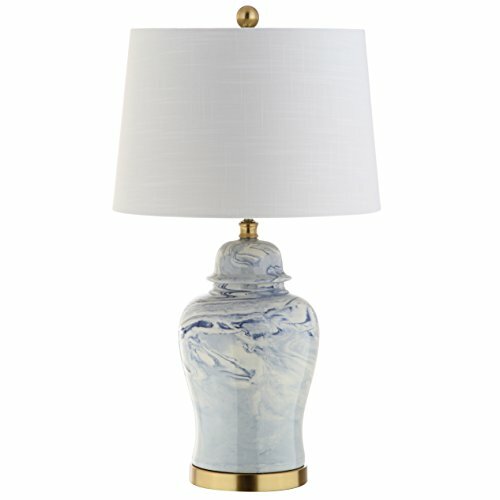 Looking for more Blue Ginger Jar Lamp similar ideas? Try to explore these searches: Glass Bead Connector, Blue Stiff Brush, and Indoor Benches Furniture. Look at latest related video about Blue Ginger Jar Lamp. Shopwizion.com is the smartest way for online shopping: compare prices of leading online shops for best deals around the web. 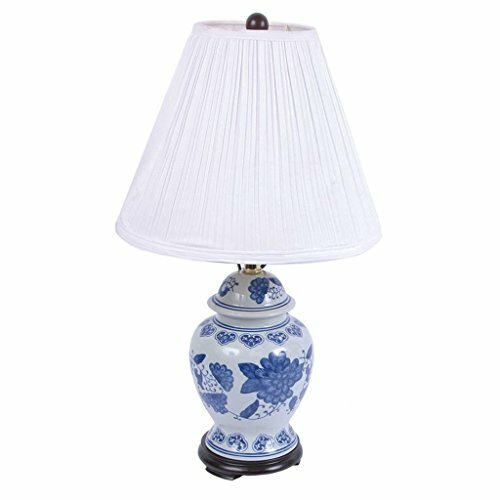 Don't miss TOP Blue Ginger Jar Lamp deals, updated daily.